Posted December 9, 2012 in kinetics. 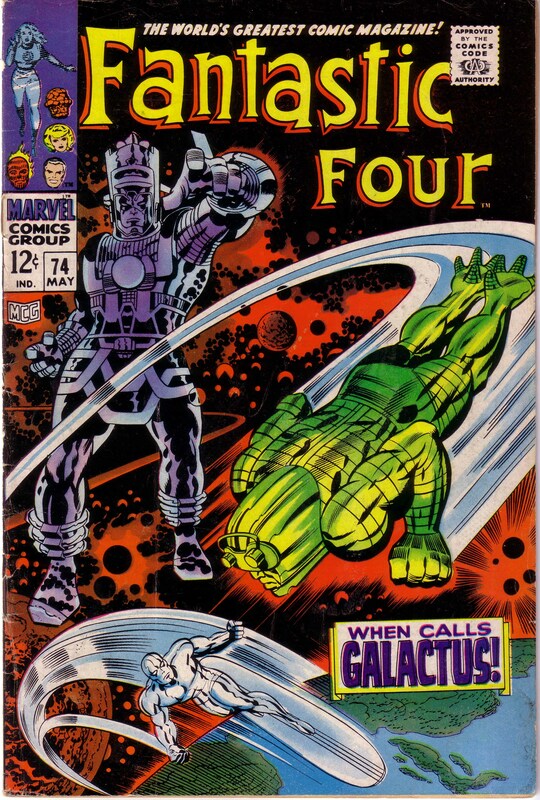 Jack Kirby’s life force was attuned to the rhythms of New York City. Growing up on the Lower East Side’s Essex Street, the King began to inject the flavor and wild exuberance of that neighborhood as well as the teeming bustle of the greater metropolis into his earliest stories. One of his most vibrant series, Star Spangled Comics Newsboy Legion was set in Suicide Slum, a fictional version of Kirby’s crowded birthplace. The Legion was a motley crew of youths. Their protector, the heroic Guardian was a costumed hero whose alter ego was police officer Jim Corrigan. With the city as its backdrop, the series action exploded throughout the streets, alleys and rooftops of Suicide Slum. In particular, Kirby seemed to exult in dizzying aerial acrobatic conflicts that spanned the gulfs and canyons of Manhattan. Clearly, such action had been inspired by the artist’s vividly remembered inner city experiences. 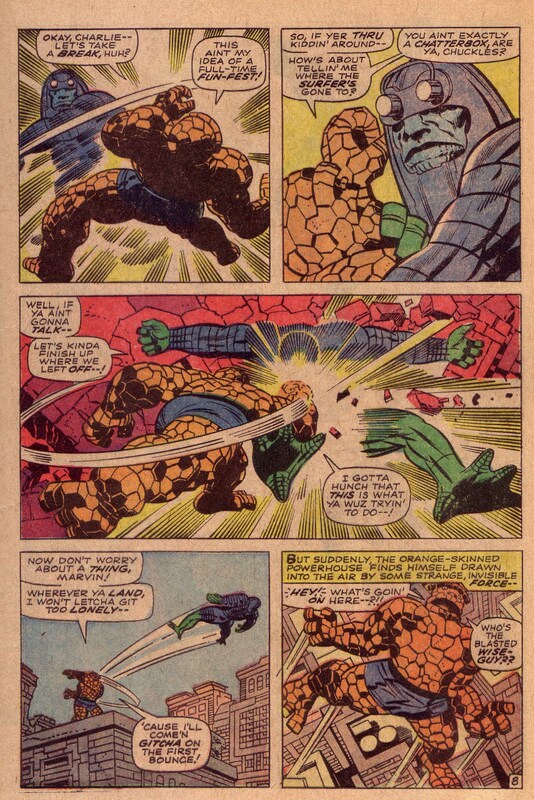 In a Comics Journal #134 interview conducted by Gary Groth, Kirby described some of the more unusual gang fights that he had engaged in as a boy. 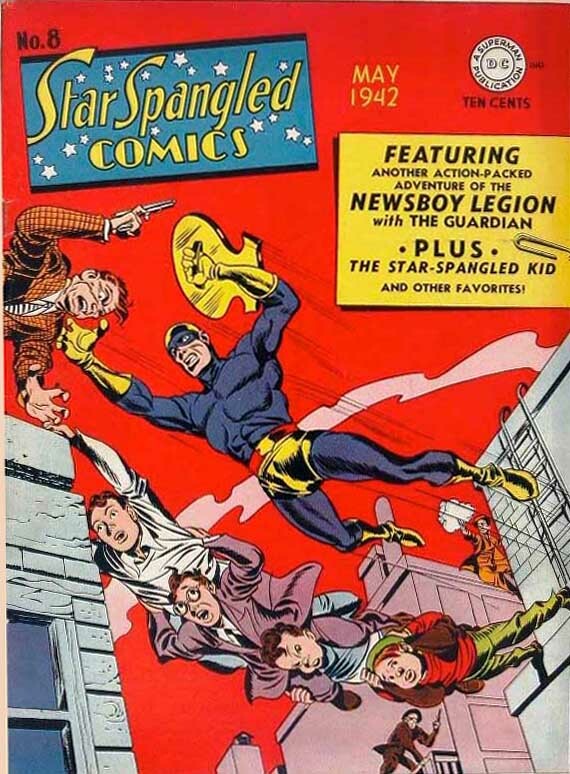 Here above on the cover of Star Spangled Comics #8, we see just such a scene, as members of the Newsboy Legion create a human bridge between buildings with their connected bodies. The skewed angle of the structures and the dynamic leaping form of the Guardian create a tangible sense of vertigo for the viewer. Twenty odd years later, The Fantastic Four was one of the first comics to be set in New York City as opposed to a generic town such as Superman’s Metropolis. 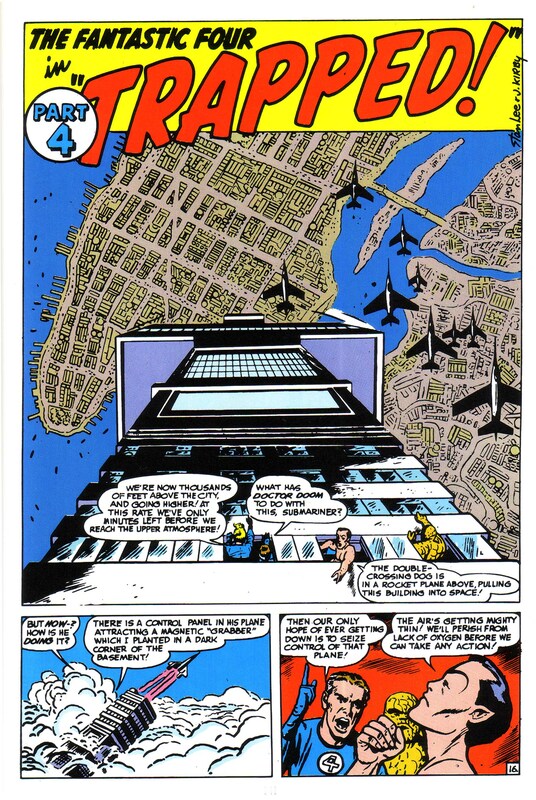 Here, in a large panel from the sixth issue, Kirby gives us incontrovertible evidence that the Four’s Baxter building headquarters was located in Manhattan, before it had been mysteriously levitated above the island. The perspective slant of the structure again gives as strong sense of vertigo, as our angle of vision plunges us earthward. The genius stroke of placing the formation of jets below gives us scale, as well as a directional indication guide. My eye scans directly from the red A in “Trapped” and across the avenue below it to the first jet, and then up and around to the figures leaning out of the windows. As the perspective of this panel indicated, the direction of The Fantastic Four comic seemed to gradually reach ever higher into the cosmos, culminating in the interstellar sagas of Galactus and the Silver Surfer. Still, the FF were not above regularly duking it out in the streets of New York, as this page below from FF#74 so aptly shows. Kirby took great pleasure in destroying huge blocks of New York while the heroes and villains bashed each other through buildings. As in panel five of this sequence, the Thing would often find himself suspended comically above the landscape, like Wiley Coyote just before a fall. This was often an opportunity for Kirby to give us a marvelous perspective shot of the buildings below him. Above, the cover of this same magazine shows us the culmination of the aforesaid progression towards the cosmic. Our point of view has now risen so high above the city that we can see the Earth’s curvature. For a period of time, Kirby’s concern would be less concerned with the mundane goings on of places like Suicide Slum and more preoccupied with matters of intergalactic import, This was after all the late sixties and many of us were obsessed with Cosmic Consciousness. Eventually, we would all have to return to earth.